Amagugu International Heritage Center held a Matobo Heritage Festival in Matobo district over the weekend, which attracted more than 150 participants from various backgrounds and age groups. A first of its kind, the festival attracted key stakeholders that included National Arts Council, Former Bulawayo Mayor Japhet Ndabeni Ncube, members of the civil society and the general public. Students from High schools Wanezi High School and Dominican Convent High School could also graced the festival which had various activities lined. These included the tour of the murals, braai and music in the rocks, storytelling and discussion sessions where participants were made aware of various cultural and historic elements in Matobo that led to the area being declared a World Heritage Site. 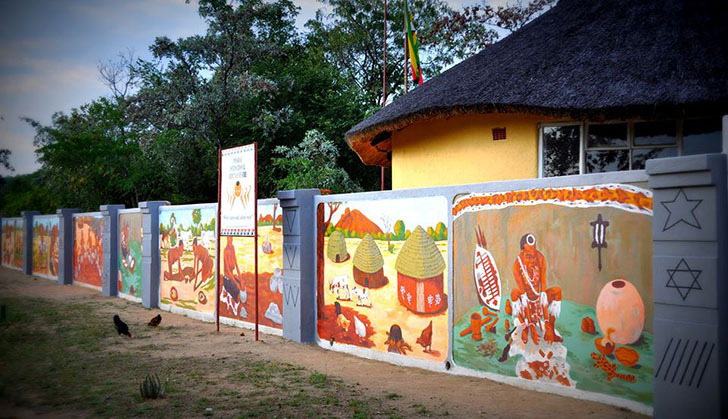 These include rock art, King Mzilikazi's grave, grain bins, Njelele shrine among many more. Participants were also treated to a Wosana traditional dance session, a symbolic dance traditionally performed at the Njelele shrine for rain making ceremonies. There were also Performances by various groups including IYASA, Djembe Monks, Drums of Peace, Nobuntu and Sunduza Dance Theatre. Founded by the respected historian Mr. Phathisa Nyathi, the Center has established itself as a leading promoter of local cultures in the Western region of Zimbabwe. It has also been instrumental in taking local cultures to regional and global spaces with its recent coverage by BBC being a testimony of its global reach and presence.